The raptors are coming through Gunsight Mountain (there’s nifty movie here!) like gangbusters. The Golden Eagle tally is over 600 and the Harlan’s Hawks streamed in with 61 on Monday. Also on Monday, there were 3 Sharpies, 1 Rough-legged, 2 Goshawks, and an amazing Boreal Owl calling during the middle of the Day! The Anchorage Big Day Wrap-up! It was a Cutthroat Birdwatching Competition at it’s finest that combined no sleep with in-your-face attitude and Margaritas! It was the First Day of Spring Anchorage Big Day. TEN teams squared off to see who could find the most avian species in the 24 hours between 5:00 PM on Friday and 5:00 PM on Saturday. Lynn Barber holds the record for the tenth highest North American Big Year total ever. When she found 723 birds in 2008, it was the highest Big Year total ever for a woman. She set the Texas Big Year all-time record (522 species) in 2005, she found 350 species in one year in South Dakota, and this year she has already smashed all existing records for an Alaska Big Year by finding 299 species thus far (as of October 9, 2016, 307 species to round out the year). The Ebro Delta is the la rgest wetland in Catalonia (Spain), and one of the most important bird areas in the western Mediterranean Sea with over 300 species of overwintering and transient birds including the awesome and unique Hoopoe. Come and learn about this important bird area and others in Catalonia with Enric Fernandez, who lived in Spain for 22 years before moving to Alaska. We finally have the results for the 2016 Anchorage Christmas Bird Count which was held on Saturday, December 17, 2016. We’re sorry for the delay in reporting. It took us awhile to undo the damage done to the Anchorage Audubon CBC database by Russian hackers. Our Anchorage teams of Christmas Counters located 37 species of birds on count day with one additional “count week” species (a Short-eared Owl!) being reported bringing the total number of species seen during count week to 38 species . The total number of individual birds spotted was 20,739. This graph shows that the 2016 CBC was perhaps a little bit below our previous fifteen year average which appears to be “about” 40-42 species (give or take), but what we lacked in quantity, we MORE than made up for in the “quality” department….with two 1st ever Anchorage CBC records including a Song Sparrow (1st ever Anchorage CBC record), the American Kestrel (again 1st ever Anchorage CBC record), and a Pacific Wren (2nd ever Anchorage CBC record) following the 1st ever Anchorage CBC record in 2015. Of the 38 species observed during count week, 7 species were represented by only ONE individual being sighted. Bohemian Waxwings were once again the most numerous birds found with 7,857 seen (compared to the 54 year average of 3,851). Common Redpolls made an impressive showing this year with 3,227 seen (compared to the 56 year average of 1,425), which landed them in second place for numbers sighted as well as Black-capped Chickadees with 2,085 seen (compared to a 57 year average of 893), which landed them in third place. Data from the Anchorage Count follows below, and is sorted according to the number of each species seen. The Tally Party and Chili Feed was a fabulous get-together, and we’d like to thank the First Congregational Church, Lynn Barber, and Louann Feldmann for making the evening possible. The graphs total about 1 megabyte (1 MB), so they aren’t small, but nor are they large, representing about 1/700 of a typical movie available for streaming on the various movie streaming services on the web. So you choose the fun – the number of species recorded during the last 50 or so years of the Anchorage CBC, or 10-1/2 seconds of the movie “Dumb and Dumber”. We’ve actually spotted what looks to be a data error in the historical data based upon these graphs. If you can spot it, please let us know, as we’ll definitely put YOU on the short list for our anti-Russian hacking team we are assembling! Come learn about some of the remote and adventurous birding locations in Kenya, East Africa, with Andrew Fisher, who spent 14 years there getting to know African wildlife. He will share some of his favorite birding locations, when to go, what species to look for, and share fun stories of getting stuck in the mud, camping with elephants, and where and when to not get out of your vehicle. We’ve got a real treat next Wednesday, March 8th, when Neil Paprocki will give a last minute program about the Gunsight Mountain Hawkwatch. Neil will be in town to get his team started on the Second Ever full-season monitoring of the raptor migration through the Gunsight Mountain area. This year’s count will be Sat urday, December 17th followed by the Tally Party and Chili Feed Potluck at the First Congregational Church, 2610 E. Northern Lights Blvd. just east of Lake Otis. This is simultaneously a great idea and a Big Fat Mess. Everything from ABA Life Lists to Big Years is now changed with the addition of new “countable” birds, and we’ll attempt to put it all in perspective at our November program on Thursday, November 17. In case you haven’t noticed, it’s Fall. That means it’s time to stock up the bird feeders, and our October Audubon Program features “Bird Feeders in Alaska. ”According to the latest estimates, over 52 Million Americans feed birds and other wildlife at their homes. It’s great citizen science, it’s great fun, and we’ll present a rundown of types of food for birds, types of feeders, and other tips for attracting wildlife to your yard. This spring, a decades-long goal will finally happen for the second year in a row! We have always wanted to do a complete and thorough Hawk Watch for an entire season at Gunsight Mountain. This year, thanks to Neil Paprocki, it will become a reality once again! If you’re looking for the perfect way to learn what birding is all about, we will present a course in “Birding for Beginners” at Anchorage Audubon’s March 16 Meeting. This is a fabulous opportunity to learn about Birds and Birding from the beginning, and it’s just in time for our Spring Migration arrivals. From Eklutna to Portage–How many species can your team find in 24 hours from 5:00 PM on Friday March 24, 2017 until 5:00 PM on Saturday March 25, 2017. Our Annual Hawk Watch Weekend in collaboration with the Mat-Su Birders will take place this year on April 15 & 16th. It’s the Greatest Event of the Birding Year in Alaska! Our Hawk Watch is known as “The Harlan’s Hawk Capital of the World” because you’ll see more Harlan’s Hawks here than anywhere else on Earth. There is no ornithological tailgate party like this anywhere in the country, and this year we know of at least one birder who’s traveling all the way from Utah for the event. 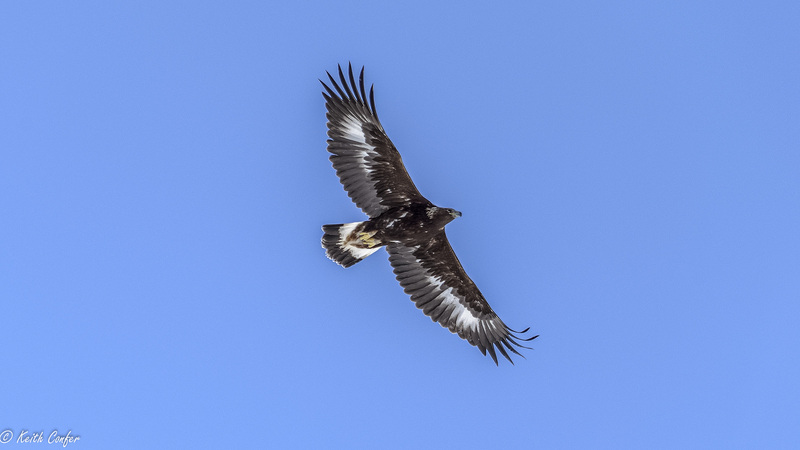 Celebrate the return of spring migrating raptors with this annual Anchorage Audubon field trip of the spring. 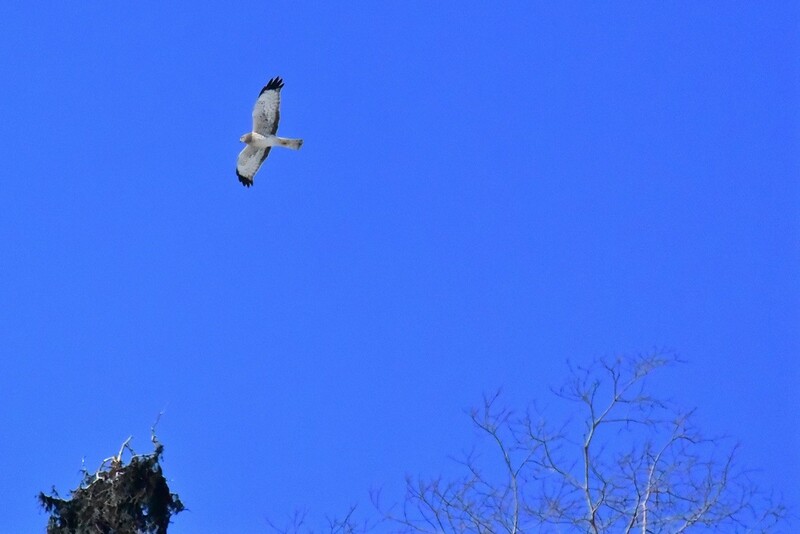 Migrating raptors that can be seen along the ridge line near MP 118.8 include Golden Eagle, Harlan’s Red-tailed Hawk, Rough-legged Hawk, Sharp-shinned Hawk, Northern Goshawk, American Kestrel, Peregrine Falcon, and Merlin. Swainson’s Hawk and Osprey have also been seen migrating through this area as well as Swans, Lapland Longspurs, Snow Buntings, and the occasional Northern Hawk Owl. Bring warm clothing, binoculars, spotting scopes, lunch, snacks, and lawn chairs and sit back while you watch migrating raptors glide over the nearby ridge. Generally great weather, albeit a little chilly sometimes – The dog doesn’t quite seem so enraptured by the passing raptors as is everyone else. 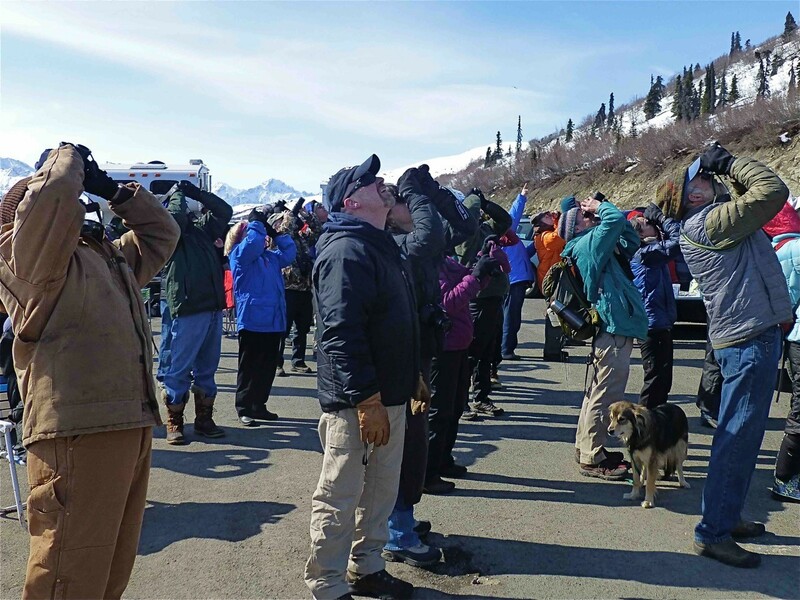 The Hawkwatch is a spectacle that is unrivaled in Alaska. It’s a great gathering, a fabulous party, and the birds are astounding. If you have never attended the Hawk Watch, you’ll never be the same. The scenery is gorgeous! Meet at 10:00 AM at the wayside at Milepost 118.8, Glenn Highway. A short raptor identification talk will take place at 10:30 AM. On Sunday, April 16, the Mat-Su Birders will host their annual Hawk Watch Potluck BBQ at the same location. For details on the Mat-Su Hawk Watch – www.matsubirders.org/html/calendar.html. A special birder’s banquet will be hosted by the Sheep Mountain Lodge on Saturday night, and plans include a talk by the Professional Hawkwatchers from Hawkwatch International who once again will be conducting an entire-migration census of the site during March, April, and May. Rooms are available at The Lodge for those who want to stay on site for the entire Hawkwatching Weekend. And once again, Anchorage Audubon and the Mat-Su Birders are honored to supply Port-A-Potties at the event for your Hawkwatching pleasure. Our April Program is another first for Anchorage Audubon. We have never had a presentation on the birds and wildlife of India, and this will be an unbelievable treat. Julie Jessen is a stunning photographer with amazing stories to tell. Imagine India and you may think of big cities and people…but do you think about wildlife? Highlighting a vast number of migratory shorebirds stopping over on the Copper River Delta, this is truly a great festival in the fabulous town of Cordova. This is where you go for Avian Tonnage! This year’s Keynote Speaker is none other than David Allen Sibley – the ultimate Field Guide guru.